CellarDoorMETRICS® is an easy to use system that will help you to track the performance of your cellar door, tasting room or wine cellar. Through a secure logon, you can gain access at any time to up-to-date, accurate, reliable analysis of your cellar door operation. If you already track your cellar door performance, you will find that CellarDoorMETRICS® adds another level of business intelligence! You will have access to a range of reporting tools to compare your results with others – the ability to judge your ‘relative’ performance – and set realistic targets and benchmarks. Fax your completed Weekly Data Collection Form to us and we will take care of the data entery for you. 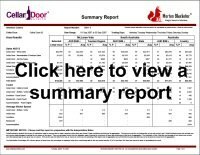 You will also recieve a monthly printed Summary Report, while still having full access to all the functions on the CellarDorrMETRICS® website, including your updated cellar door figures. Alternatively, you may opt to enter your own cellar door data if you prefer. If you can measure it you can manage it! There is no other system available where cellar doors can gain access to such in-depth, up-to-date business intelligence for only AU$30 per month (ex GST)! OK, I'll give it a go. What do I do next? How much money do my visitors spend? What do they spend it on? How many visitors do I have each week? How many visitors do other cellar doors in my region attract? Which days are they open? What trading days attract the highest sales in my region? If I opened on a Thursday, how many visitors might I expect to my winery? What is the average value of each sale and how does this compare to others? What facilities do they have on site? If I had a restaurant, what likely impact would this have on my cellar door sales? Which events and marketing activities really made a difference to my cellar door performance? How did others in my region benefit from these events? Want to join but your country is not listed? Contact us.